Take advantage of the summer bounty and preserve peppers to enjoy all year. If you don’t grow your own peppers, consider purchasing in bulk from local growers at your farmer’s market. It’s been a great year for growing peppers in the home garden here in New England. Like the rest of the east coast, rainfall has been below average in Maine all summer. Peppers are one crop that has thrived in these conditions. This year, our summer has been a bit hotter and dryer than usual. The peppers flourished in the heat, and the plants have produced double the amount of fruit as normal years. The hot, dry summer conditions have been especially accommodating to the hot chili varieties normally grown in warmer climates. Often times when growing these types of peppers in cooler climates, they not only produce less fruit, but the peppers sometimes don’t have a lot of heat. I think they are pampered too much with our frequent rain. This year, the hot chili peppers are much hotter. The easiest way to preserve peppers is to freeze them. Peppers are one of the few vegetables that can be frozen without having to blanch first. Surprisingly, frozen peppers do not turn to mush when thawed either. They do lose some of their crispness, but maintain the flavor of fresh peppers. Thawed peppers can be used to make salsa, fajitas, or any cooked recipe where you would normally use peppers. Frozen peppers are easy to chop while partially defrosted. Wear gloves when working with hot peppers. 1. Select fresh peppers with no blemishes or soft spots. Wash to remove any residue and soil. Allow the peppers to air dry. 2. Trim out the stems, seeds and membrane of bell or sweet peppers. Hot peppers that are used with their seeds can be frozen whole. Bell Peppers: I like slicing bell peppers in strips. It makes it easy to grab a handful as needed for fajitas or stir-fries. The frozen strips can be chopped into smaller pieces for soups or other recipes. Jalapeño: I freeze jalapeño peppers whole, but you can also remove the stems, seeds and membrane and cut into pieces before freezing. Anaheim: The skins of the Anaheim and New Mexico type peppers are tough, so I roast these on the grill and peel off the skins and seed the peppers before freezing. To peel, blister the skins by grilling or broiling until the skins crack and separate from the flesh. Remove from the peppers from heat and place in a covered glass bowl to steam. Once the peppers are cool enough to handle, remove skins, stems, seeds, and membrane. • See: How to Roast and Peel Peppers for more details or watch the video below. 4. Spread out the prepared peppers on baking sheets and freeze until solid, and then add to freezer bags. Freezing the peppers on a baking sheet before packaging helps prevent them from sticking together and allow you to grab a handful when needed. 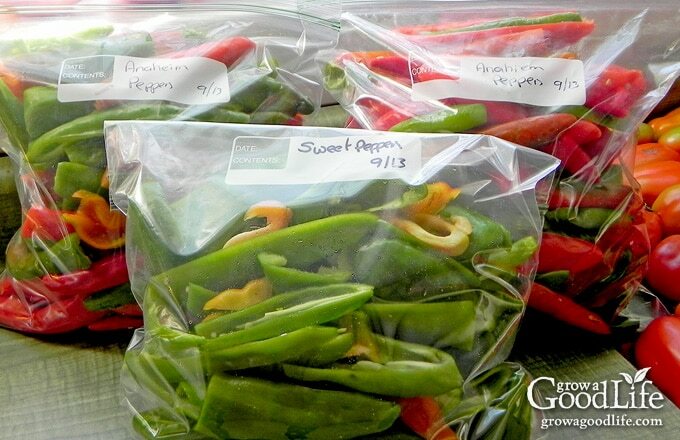 Pack whole peppers and prepared Anaheim peppers into freezer bags. Remove as much air as you can, label, and freeze. Use within 8-12 months. 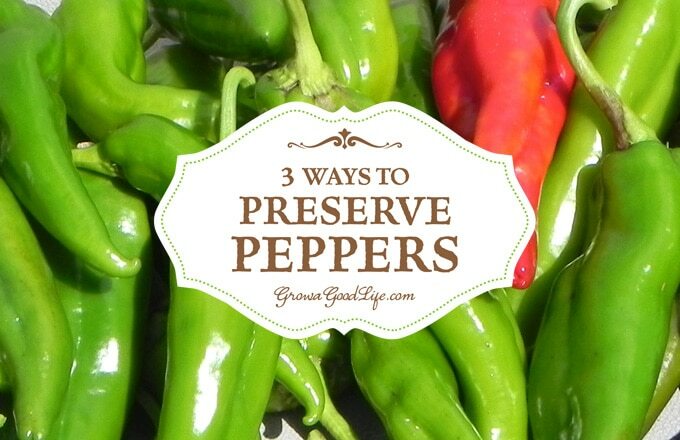 Drying your pepper harvest is an excellent way to preserve peppers. Dehydrating concentrates the flavor and heat of the peppers. Store fully dried peppers in airtight jars. You can add the dried peppers to soups, stews, or chilies. The peppers will rehydrate using the liquid in the pot. To rehydrate dried peppers before using, place them in a bowl and add hot tap water to cover. Let them soak until softened, about 30 minutes. Dried peppers can be crushed into pepper flakes using a food processor, or blended into chili pepper powder using a coffee grinder. Make your own Homemade Taco Seasoning. Save some of the seeds to grow next year. 1. Hang and Air Dry: If you live in a dry climate with day temperatures above 85˚F (20˚C), air-drying is the easiest method to dry peppers. Use a long, needle, and string the peppers together through the stems. Leave plenty of room in between peppers for proper airflow. Hang your peppers to dry in an area with good airflow and sunshine. Depending on the humidity in the air, this method can take 3-4 weeks until the peppers are fully dry. Peppers are dried completely when brittle. 2. Food Dehydrator: Since our summers here in Maine are humid, the moisture in the air can prevent peppers from air-drying naturally. A food dehydrator is the quickest and easiest way to dry peppers. A dehydrator works by circulating a gentle flow of slightly heated air through screens. Small chili peppers can be dried whole. Larger peppers will dehydrate quicker when cut into pieces. Spread the peppers out on the screens and set the temperature between 125°F and 135°F (or per your food dehydrator’s instructions). Rotate the screens frequently and remove the peppers that are dry. Dehydrating time can take 4-12 hours depending on the peppers. 3. Oven Dry: Alternatively, peppers can be dried in the oven at a very low temperature. Spread the peppers out on baking sheets and place in a 150˚F oven. Leave the door open a crack to allow moisture to escape. Check on the peppers every 30 minutes and rotate and remove the ones that are dry. Depending on the peppers, drying in the oven can take 1-2 hours. Most of the peppers I grow are used to make and preserve salsa. 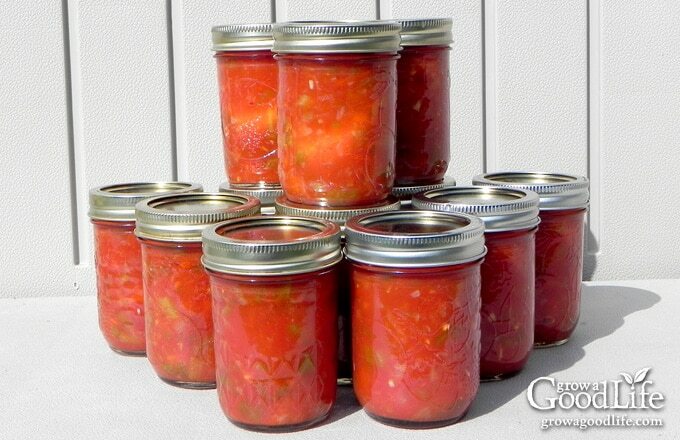 If you are canning salsa, it is important to follow a safe canning recipe. Because of the mix of ingredients, most recipes require that you add vinegar to balance the acidity to be safe for canning. If you are not fond of the vinegar flavor in canned salsa, consider trying my Grilled Tomato Salsa recipe and freezing your salsa instead. Since there are so many varieties of peppers, and they come in all shapes and sizes, it may take a bit of experimenting before you are able to find a method to preserve peppers that works for you. I find that peppers that have thick walls, such as bell, jalapeño, and pimentos are excellent for freezing. Thin-walled cayenne, de arbol, and japones are easy to dry using a dehydrator. 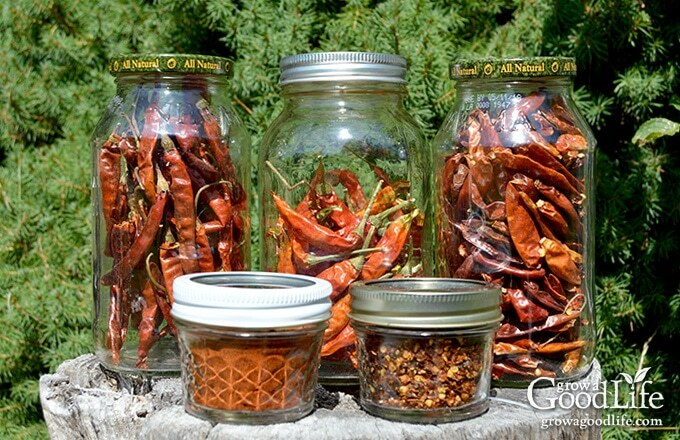 What is your favorite method for preserving peppers? Let us know in the comments. Does anyone have a good recipe for preserving sweet italian red peppers to make rellenos during the winter months? I’m trying to keep them as firm as possible. Canning seems to make them mushy and doesn’t make them stuff able. Thanks! Marilou, Have you tried freezing peppers? I grow hot peppers each year and have been putting them up in vinegar. Will have to try a dehydrator with some. Last year I grew habanarro and ghost peppers. Now those are really warm to me. They are good in cornbread too. Last year I grew some habaneros and dried them in a dehydrator. Then I ground them in a food grinder with a little salt and have been sprinkling them all over this year’s tomatoes. Yum! This year I don’t have any hot peppers unfortunately. But I will be freezing all the mild ones I have! Haven’t heard of freezing them on a cookie sheet first before. Definitely going to try this idea very soon. Growing up in Texas, I spent many summers stringing peppers for my mom. A warning! If your thread comes out if your needle, don’t lick it before rethreading it! ;). Thanks for the great tips! I too pickle hot banana peppers – yum! As with tomatoes, I like preserving peppers in a variety of ways, including freezing and drying (now that I’ve finally got a dehydrator! ), which gives me a good range of off-season options. Margaret, I wish I had more room to grow different varieties of peppers. There are so many delicious uses for them. Would you be willing to share your recipe for pickling the banana peppers? Hi Mike, I don’t think Margaret will see your comment here. You can find her blogging at Homegrown – Adventures in My Garden. I grow banana peppers and like to pickle them. They are tasty on an antipasto tray and in sandwiches. We have about 20 pepper plants – bell for roasting/marinating and salsa; hot for salsa, hot sauce and pepper jelly; and Italian sweets for cooking fresh (and freezing if there’s any left! ).